Last years’ post also showed that the New York Police Pension Fund Article 2, the New York City Fire Department Article 1B Pension Fund, and the New Jersey Police and Firemen’s Retirement System are deep in the hole – despite sky-high taxpayer contributions in the case of the New York City funds, contributions that drain money from other priorities. As for the other pension funds in New York and New Jersey, I have updated most of the charts with one more year of data. These charts and commentary follow below. First, a little housekeeping. My original post on long term Census Bureau data on pension data for police and fire plans in New York and New Jersey is here. If you haven’t read it already, you should read it first. The updated database, which includes far more data than I have highlighted in the charts, is here. Just click on the “police and fire” tab at the bottom. The spreadsheet with the charts, and the data they are based on, is here. While the Census Bureau has FY 2012 data for most pension plans, data for the New York City Police Pension Fund comes out later, and only FY2011 data is available. That is updated from the FY2010 data cited last year. As noted last year, the share of former NYC police officers and firefighters who receive disability benefits, as opposed to regular retirement benefits, is very high compared with police officers and firefighters elsewhere in the U.S. This is costly, because in New York City whereas regular retirement means a pension at 50 percent of final pay after 20 years, disability retirement means a pension at 75 percent pension after 20 years. 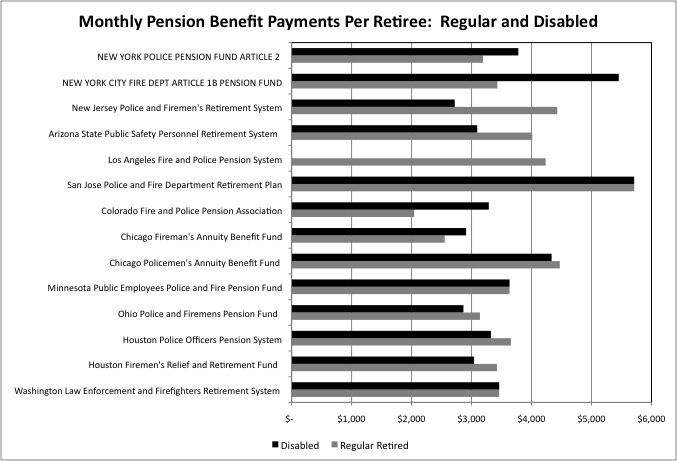 This charts shows disability pension beneficiaries as a percent of total retired police officers and firefighters, and payments to disabled beneficiaries as a percent total payments to retired police officers and firefighters. (The recipients of survivor benefits are excluded from the calculation, since they may be survivors of workers who had been regular retirees, disabled retirees, or those who died on the job). I didn’t update the chart because not much is going to change from year to year, and it isn’t going to be as interesting the second time. 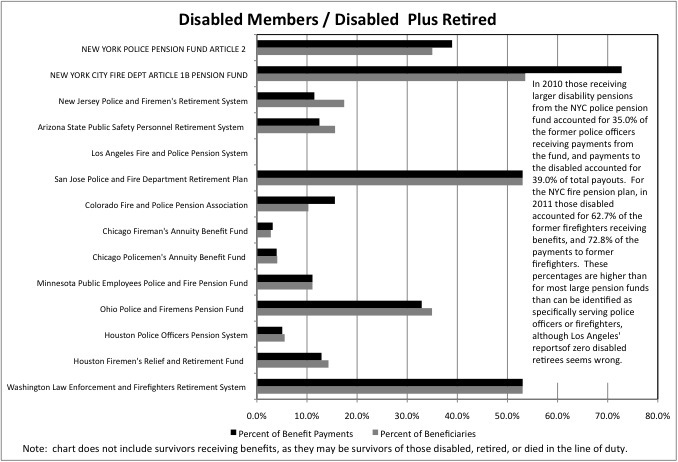 In 2010 those receiving disability pensions from the NYC police pension fund accounted for 35.0% of the former police officers receiving payments from the fund, and payments to the disabled accounted for 39.0% of total payouts. For the NYC fire pension plan, in 2011 those receiving disability pensions accounted for 62.7% of the former firefighters receiving benefits, and 72.8% of the payments to former firefighters. These percentages were much lower in New Jersey, and most other places whose data I was able to obtain, although the report of zero disabled pension beneficiaries in Los Angeles seems wrong. The disabled also accounted for more than half the pension beneficiaries and payments for the Washington (state) Law Enforcement and Firefighters Retirement System, and the San Jose (California) Police and Fire Department Retirement Plan. While the percentage of final salary that is paid in pension benefits goes up if a police officer or firefighter retires as a result of being disabled, the final salary on which that pension is based could be lower. A police officer or firefighter who really is injured on the job may be forced to leave it early in their career, when that salary is low. Moreover, those who become disabled may not live as long as those who are not disabled. So among the legitimately disabled, total pension costs should not be half again as high as they would be for those in regular retirement, as the pension at 75 percent of salary vs. 50 percent of salary would imply (75 is 50 percent higher than 50). In most pension plans, as a result, the percent of total benefit payments going to disabled former police officers and firefighters is not that different that the percent of former police officers and firefighters who are disabled. In some cases it is lower. In New Jersey, the average regular retired police officer or firefighter collected an average pension of $4,429 per month, whereas the average disabled former police officer or firefighter collected just $2,720. For New York City, on the other hand, the average regular retired police officer or firefighter collected an average pension of $3,191 per month, whereas the average disabled former police officer collected $3,780, or 18.4% more. The average regular retired firefighter collected an average pension of $3,431 per month, whereas the average disabled former police officer or firefighter collected $5,455, or 58.1% more. These figures are affected by how long ago the average police officer or firefighter retired, and how much inflation has occurred since then. The average payout for disabled NYC firefighters may be higher since so many went out of disability recently, in the wake of 9/11. These figures do not include payments to survivors, and thus do not include those killed in the line of duty. 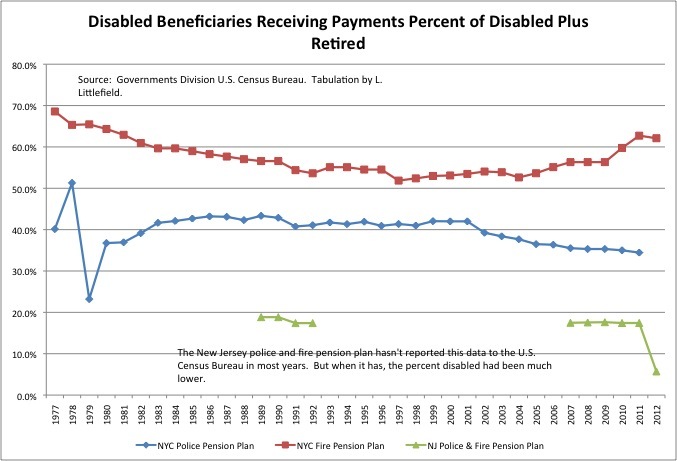 This chart is updated, and shows disabled pension benefit recipients as a percent of total (non-survivor) pension benefit recipients for the NYC police, NYC fire, and New Jersey police and fire pension plans over time. While high, the percent of former NYC firefighters who were disabled (rather than regular retired) had been falling until recently. In 1977, disabled beneficiaries of the NYC fire pension plan accounted for 68.6% of the total, but by 1997 it had fallen to 51.9%. That is still a high number, and one wonders why it was acceptable to the firefighters union. It is so high that it implies that in the past – in the 1960s and 1970s – disability fraud was rampant. In the 1980s and 1990s as those who were illegitimately collecting disability benefits died off, and new groups of firefighters retired with a lower rate of disability, the share of total retirees who were retired fell. The share of NYC former NYC firefighters who are disabled started to increase again after 1997, implying that more of those starting to collect benefits were claiming disability compared with those dying off. Some of the reversal and recent increase may be a result of 9/11. But not all of it, since it started before 9/11. The percent of pension beneficiaries who were disabled increased from 51.9% in FY 1997 to 53.5% in fiscal 2001 (before 9/11) to 62.7% in FY 2011. The update is that percent of former NYC firefighters who are disabled, rather than regular retired, fell from 2011 to 2012. For former NYC police officers, the percent of former officers receiving disability pensions has continued to fall, from about 42.0% in 2001 to 35.0% in 2010 and 34.4% in 2011. This implies that the share of NYC police officers who are going out on disability is significantly lower than in the past, although the indictment of so many former officers implies that disability fraud has not been eliminated entirely. Once that fraud occurs, it is very difficult to prove and reverse. Significantly, the former police officers and firefighters were indicted for falsely collecting from the federal disability benefits system, not falsely collecting disability benefits from the New York City pension fund. To qualify for federal benefits, one has to prove they are so disabled they cannot work any job. That is easier to prove than the requirement for a city disability pension, injuries that make someone physically incapable of being a police officer or firefighter. I’d imagine that for someone who stays on the job long enough, old age alone would lead to disability by that standard. For police officers, the share taking disability retirement was higher in the past despite efforts by the New York State legislature to make what would otherwise be considered disability fraud legal. For a host of maladies, as diagnosed by a physician of the former employee’s choosing, former police officers and firefighters now receive a 75 percent disability pension whether they are disabled or not, and whether it had anything to do with the job or not. Some of these rules make some sense, like an automatic qualification for a disability pension for former firefighters with lung problems. But most do not. And more are added every year, in exchange for political support for incumbent state legislators. Even so, the percent of former police officers who are collecting disability pensions keeps going down. One factor: uniquely, if police officers are found to have committed job-related misconduct their pensions can be revoked. This provision, which was applies only to police officers, was added in the wake of the police scandals of the 1970s. The data implies that back in the pre-Serpico, buddy-boy era, an era when the NYPD failed to protect New Yorkers from crime, a large share of the officers were sleazebags. The percent of retirees with disability pensions was over 50 percent in 1978. The NYPD has also become more diverse in recent decades, with regard to the ethnic background of its officers. That is also the case for the workforce at New York City Transit, where a larger share of the workforce now provides a days work for a days pay and service has improved. But that isn’t the case everywhere. The buddy-boy era continues at the Long Island Railroad, where disability fraud was rampant until recently. As for New Jersey, in most years the Census Bureau was not able get data from the New Jersey Police and Firemen’s Retirement System separately for the disabled and regular retired. In 2012, according to the data the Bureau was able to get, the number of disabled beneficiaries was somehow 65.0% lower than it had been in 2011. This must be some kind of data error, or worse, a response to my calling attention to this database last year. The number of disabled beneficiaries had slowly risen from 4,371 in 2007 to 5,404 in 2011 before suddenly falling to 1,881 in 2012. Unless 3,500 existing retirees somehow died or became undisabled, that can’t be right. Retirement benefits for NYC police officers and firefighters are extremely costly, and that cost has been soaring in recent years. 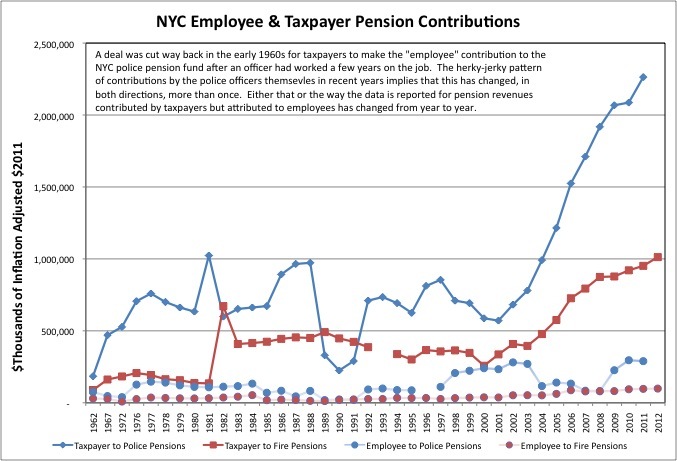 As the chart shows, taxpayer payments to the New York Police Pension Fund Article 2 topped $2.25 billion in FY 2011, up 8.5% from the year before. Payments to the New York City Fire Department Article 1B Pension Fund exceeded $1.0 billion in FY 2012. While there has been some variation, with taxpayer contributions falling for a couple of years in the early 2000s during the administration of former Mayor Giuliani and in the late 1980s and early 1990s, during former Mayor Koch’s last election campaign and the deep early 1990s recession, for the most part taxpayer contributions to these pension funds have been substantial over the years. As for the police officers and firefighters themselves, their contributions to their own pensions have been limited. Taxpayers had been kicking in two-thirds of the theoretical 7.5% employee contributions. But I had read in old police pension fund documents that even the 2.5% employee contribution that was left disappeared after a few years, meaning that over a career police officers and firefighters kicked in next to nothing. As a result of subsequent state legislation, however, police officers and firefighters hired since July 1, 2009 have been forced to pay their own pension contributions. The police and fire unions sued to overturn the law, and lost. “It is our belief that there should be equal pay and benefits for all police officers wearing the blue uniform of the NYPD,” said PBA president Patrick Lynch. Of course if he really believed that, he could simply agree in the next contract to lower wage increases for police officers hired before July 1, 2009, to help pay for a higher pay scale for those hired afterward, to offset their higher pension contributions and later retirement. But “screwing the newbie” is an old tradition in the NYC police and fire unions, dating back decades ago when the data implies disability fraud among the older generations. One can argue that it is to pay for that fraud that new officers (and today’s taxpayers) are being left with less. The high cost of police and firefighter pensions is due in part because of the extremely costly level of promised benefits – a retirement at any age after just 20 years of work, with perhaps as much as twice that number of years being paid to be retired. For new hires, that was changed to 25 years of work in 2009, but has already been changed back to 22 years. Although some work longer and retire later, with so few years of work required, and the ability to start collecting a pension at a very young age, there are substantially more retired NYC police officers and firefighters than they are police officers and firefighters on the job, and has been for some time. By FY 2011 there were just 0.74 working police officers for every retired police officer. By FY 2012 there were just 0.67 active firefighters for every retired firefighter. The ratio has leveled off for firefighters, for now, but continues to fall for police officers. In New Jersey the ratio of active to retired police officers and firefighters continues to plunge. It was just above parity in FY 2012. Back in 2010, I created a simple model to find out how much the 20 and out pension cost, based on the police pay scale at the time. Assuming a police officer started working as such at age 22, retired after 20 years at age 42, had a life expectancy of 80 and thus had an expected 38 years in retirement on average, I calculated that someone would have had to contribute 29.6% of their pay during the officers career’ to fully fund that pension. With police officers and firefighters putting in very little at the time, I put the taxpayer contribution at about 28.7% of payroll — prior to the year 2000 retroaction pension increase. That contribution level assumed no pension spiking, with no overtime in the last years before retirement to inflate the final pay on which the pension would be based, no promotion, which would have the same effect, no inflation adjustment (none was promised before the year 2000) and no disability retirement. Any of those factors would increase the cost of the pension. (The cost of retiree health insurance, for years – decades – before Medicare picks up most of the burden, is in addition). That would have been the cost of a 20 and out pension if that much was contributed to the pension each and every year. Underfund the pension and fall behind, and far more has to be contributed to catch up. Retroactively increase benefits in a way that had not been funded in advance, and a huge hole opens up that requires vastly more in contributions to fill. 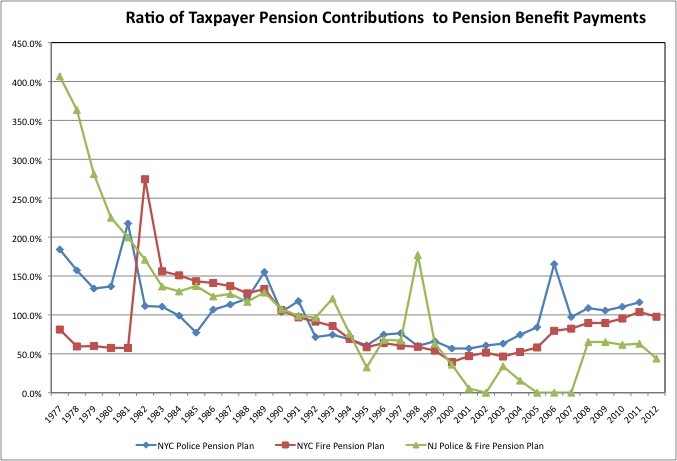 This chart shows the percent change in pension benefit payments for the NYC police and fire pension plans over the years, with past figures adjusted upward for inflation. 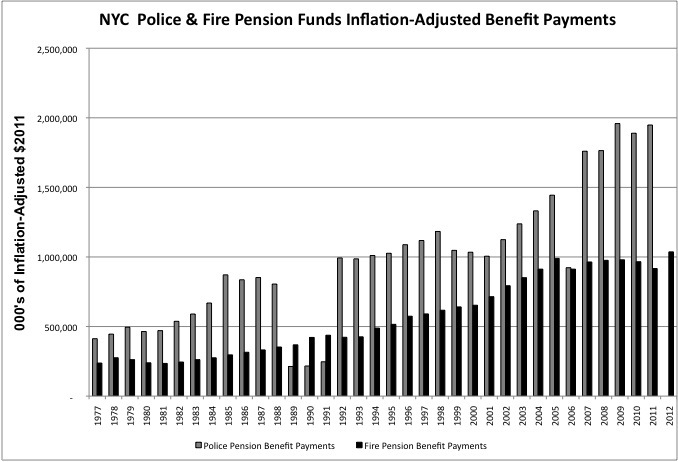 Ignoring possible errors (such as police benefit payments from 1989 to 1991), the inflation-adjusted cost of pension benefit payments has generally increased consistently for both the NYC Police and Fire pension plans. There was an initial ramp up as the first members of the new funds (as opposed to the older pension funds) retired. Before the NYC Police Pension Fund Article II there was the New York City Police Pension Fund Article I. That pension fund essentially ran out of money in the early 1960s, with New York City taxpayers forced to pay all of its pension benefits going forward. In 1962, taxpayers put in $31.6 million, and the fund paid out $33.1 million in benefits, leaving $514,000 cash on hand. The $31.6 million taxpayers put in would be $235 million in today’s money. Before the New York City Fire Department Article 1B Pension Fund there was the New York City Article I pension plan. In 1962 it paid $24.5 million in benefits, but had only $3.2 million in assets left; New York City taxpayers put in $25.4 million to make sure the pensions would be paid, or $182 million in today’s money. The fact that these funds ran out of money implies there had been mismanagement, or that unions had scored big increases in benefits that had not been paid for in advance, depleting the funds. As for the current pension plans, retired NYC police officers and firefighters, like all other public employees in New York, benefited from the huge increase in benefit payments as a result of the inflation adjustment retroactively awarded in 2000. 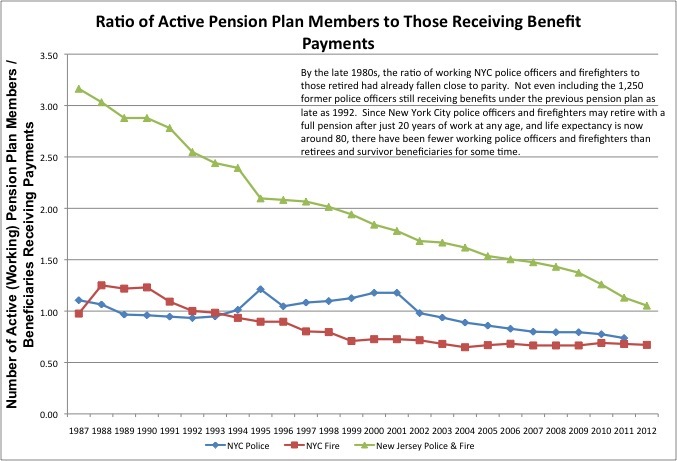 From 1999 to 2003 pension benefit payments increased by 18.2% more than inflation for the NYC police pension plan, and 32.8% more than inflation for the NYC fire pension plan. New Jersey had a similar deal at about the same time. 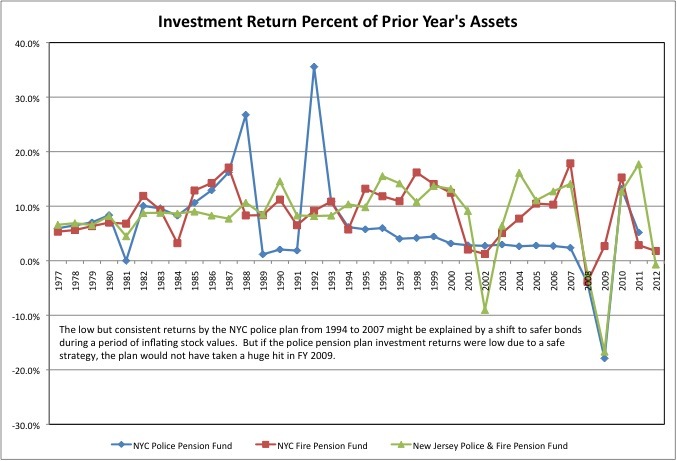 New Jersey’s police and fire pension plan benefit payments increased by 25.8% more than inflation from 1999 to 2003. Put another way, adjusted for inflation, benefit payments by the NYC Police Pension Fund nearly doubled from 2000 to 2011, to nearly $2 billion. Pension payments by the FYC Fire Pension Fund increased by 58.7% from 2000 to 2012, to more than $1 billion. The inflation-adjusted compensation of most private sector workers in Downstate New York has not increased by nearly as much, as I showed here. Since additional retroactive pension increases are passed by the New York State legislature every year, who knows what today’s police officers and firefighters, and even today’s retired police officers and firefighters, will eventually receive? There seems to be no limit – only a limit to the cost that is admitted to and paid for up front, rather than shifted to a future none of the state legislators care about. Former Comptroller John C. Liu released a report that claimed, among other things, that police and fire pensions were less expensive because for new hires the number of required years of work had been increased from 20 years to 25. But that was cut back to 22 years within months of Liu’s report. Unless the pension funds assume – and require taxpayers to pay for – future pension increases, a very high level of disability payments, and extensive pension increases due to overtime and promotions in the years immediately leading up to retirement, the police and fire pensions are going to end up underfunded. And horrific tax increases and service cuts would be required to catch up. One wonders what level of disability pensions, pension spiking, and future retroactive pension increases the City Actuary Robert North assumes today. We know that his past assumptions weren’t good enough, based on how underfunded the New York City police and fire pension funds are. This chart shows that annual benefit payments are a high percent of assets for the NYC Police Pension Fund, the NYC Fire Pension Fund, and the New Jersey Police and Fire Pension fund. This ratio implies underfunding, particularly given how young police and firefighters can retire and how many years they may thus collect. The underfunding goes back a long way for the NYC Fire pension fund, which has had the equivalent of 11 years or benefit payments or fewer in assets consistently over the years – perhaps going all the way back to Mayor Lindsay and the pension increases of the late 1960s. 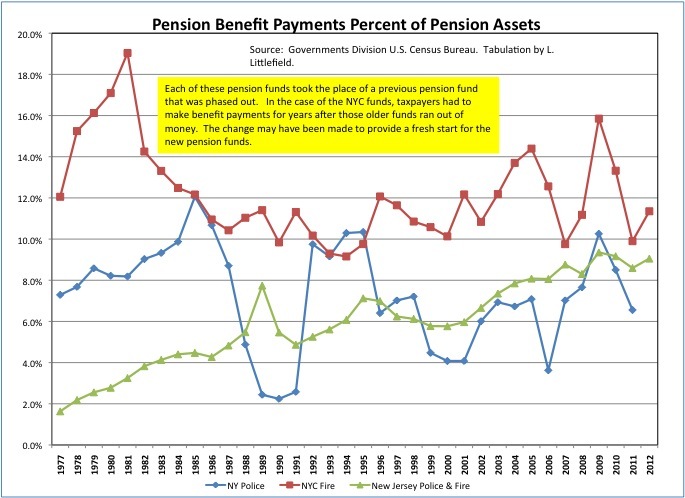 In the most recent year for which data is available, benefit payments equaled 6.6% of the assents in the New York Police Pension Fund Article 2, 11.3% of the assets in the New York City Fire Department Article 1B Pension Fund, and the 9.1% of the assets in the New Jersey Police and Firemen’s Retirement System. Those assets ought to be sufficient to pay all of the benefits owed to current retirees, most of the benefits owed to those soon to retire, and some of the benefits owed to younger workers. And given how generous pension benefits are for New York and New Jersey’s police officers and firefighters, that means there ought to be enough money in the funds to pay monthly benefits for decades. There isn’t. The New York State & Local Police and Fire Pension Plan was 89.5% funded in FY 2013, inadequate (particularly given that plan’s optimistic assumptions) but not disastrous. The New Jersey Police & Fire pension plan was just 73.1% funded. New Jersey is described as having one of the biggest pension disasters in the country. And New York City? The New York City Police Pension Fund Article 2 was just 64.9% funded, and the New York City Fire Dept Article 1B pension plan was just 52.7% funded, one of the worst in the county. I just hope I don’t get arrested for saying so, because like the funding status of and the 2008 retroactive pension increase for the NYC teacher pension plan, this is one of those things no one is allowed to talk about. And what is particularly verboten is pointing out the link between the soaring cost of these NYC pensions, as a result of all the deals, frauds and crimes of the past, and the lower take home pay and benefits for new teachers, police officers and firefighters. And all those cuts in public school programs. And the tax increases, increases the police and fire retirees themselves don’t have to pay, because their income is exempt from state and local income taxes (and in any event they generally choose to live elsewhere). In particular, New York City police officers and firefighters generally avoid living in New York City. They want a better deal. The NYC deal is likely to keep getting worse. This chart shows the ratio of taxpayer pension contributions to pension fund benefit payments for the NYC police pension fund and the NYC fire pension fund, and the New Jersey police and fire pension fund. This is another measure of the substantial taxpayer pension contributions made to the NYC police and fire pension plans over the years. Year in and year out, taxpayer contributions always equaled at least half of benefit payments paid out for the NYC plans. In New Jersey, on the other hand, contributions to that state’s police and fire pension plan were cut to near zero for several years in the 2000s. Once again, as for the other pension plans, past New Jersey taxpayers get more of the blame for the pension disaster than past taxpayers in NYC. More than perhaps anywhere else in the country, NYC taxpayers have been made to pay for pensions, even as the New York State legislature keeps voting to make those pensions richer. Today, NYC taxpayers are putting more into the NYC police pension plan each year than that plan is paying out in benefits, and nearly as much into the fire pension plan as benefits paid. The good news is at that level of contributions the plans it may take a long time to get out of the hole, but at least they won’t get further into the hole. Benefits are being paid for out of each year’s city budget, while any pension fund investment returns are used to help the pension plans recover. The bad news is that as a result of past underfunding, going back to Mayor Lindsay in the 1960s and early 1970s, and the benefit increase of 2000s (and other small ones) and extensive disability retirement, today’s taxpayers are getting zero benefit of having a pension plan with assets and investment returns at all. New York City taxpayers are paying as much as they would without any assets in the police and fire pension plans. Finally, there is the question of the rate of return. For the public employee unions and the City and State Comptrollers they put in office, gambling with pension money is a heads they win (there is plenty of money! Let’s increase the pensions!) tails the serfs lose proposition. One reasons that in New York City, the share of the pension fund money going to private equity and hedge funds keeps going up. Next thing you know the Comptroller will be heading off to Las Vegas. As noted in the previous post, based on Census Bureau data for the period from 1991 to 2012 the average for pension fund earnings for each year divided by pension funds assets as the start of the year was 7.1% for the New York City Employees Retirement System (NYCERS), 9.3% for the New York State Employees Retirement System (NYSERS), and 9.0% for the New Jersey Public Employee Retirement System. The average earnings for the New York City Fire Pension Fund was 8.4%, and the average earnings for the New Jersey Police and Fire Pension Fund was 8.3%. However, from 1991 to 2011, the most recent year available, the average earnings of the NYC Police Pension fund was just 4.6%. That figure is so unbelievable I didn’t even write about it last year. Is this some kind of error? Is this some kind of ripoff? Somebody should put a detective on the case. This entry was posted in Uncategorized on July 27, 2014 by larrylittlefield.